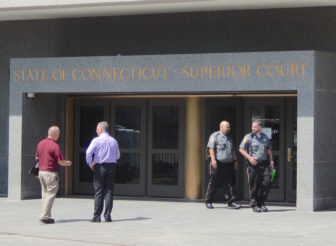 Two judicial marshals outside Superior Court in Hartford last week. The department’s Board of Labor Relations, which received the complaint Monday from Local 731 of the International Brotherhood of Police Officers, has scheduled a July 7 conference on the complaint. Further complicating matters, the Judicial Branch also is counting on eliminating 200 to 300 positions across all branch jobs in 2016-17 through retirements, resignations and other attrition factors to keep its budget in balance. Court officials have said about 60 marshals retire annually, on average, and it’s unclear whether those will be replaced.